UNAVCO has announced the selection of Septentrio to be the preferred vendor of next-generation GNSS reference stations for the Geodesy Advancing Geosciences and EarthScope (GAGE) Facility. The preferred vendor status is valid through the duration of the GAGE Facility Cooperative Agreement with the National Science Foundation (NSF). The selection of Septentrio was made following a rigorous competitive selection process. Under the agreement, Septentrio will supply GNSS reference stations to upgrade and expand the continuous GNSS reference station networks operated by UNAVCO. UNAVCO is a nonprofit university-governed consortium that facilitates geosciences research and education using geodesy. 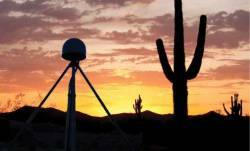 UNAVCO’s GAGE Facility includes more than 2,000 continuously operating GPS/GNSS reference stations around the world. UNAVCO-supported networks include EarthScope’s Plate Boundary Observatory (PBO), the Continuously Operating Caribbean GPS Observational Network (COCONet), the Trans-Boundary Land and Atmosphere Long-Term Observational and Collaboration Network (TLALOCNet) and the Polar Earth Observational Network (POLENet). “This preferred vendor relationship gives UNAVCO a unique opportunity to provide technical input during the ongoing development process of Septentrio’s next-generation PolaRx-series GNSS receivers,” said Dr. Frederick Blume, Sr. Project Manager for Development and Testing at UNAVCO. “The critical technology in the new generation of reference station receivers is available in the AsteRx 4OEM boards, which also provides low- and scalable-power options. This technology is being extended across the full line of Septentrio products,” said Neil Vancans, vice president, of Septentrio Americas. Septentrio is headquartered in Leuven, Belgium, and has offices in Torrance, California, and Hong Kong.